Having seen the Thursday matinee of The Illusionists 2.0 (the final performance before the official opening night) I had planned to post my review yesterday morning (after another busy Sydney Festival day on Friday). Then came word via Twitter that yesterday’s matinee had been cancelled “due to unforeseen circumstances.” Later, the Sydney Opera House sent out an email confirming the dreadful news that Dr Scott Lewis, The Hypnotist in The Illusionists 2.0 had died after falling from the balcony at the Sydney apartments where the cast of magicians are staying. Having seen him interacting so comfortably and affably with the audience during his entertaining hypnosis act just two days earlier, the news felt doubly shocking. Yesterday’s sold out matinee was cancelled, but last night’s show went ahead (dedicated to Dr Lewis) as will the rest of the season. The show must go on, as they say, brutal though that sometimes seems. Apparently the other six members of the cast paid an emotional tribute to Dr Lewis, with Yu Ho-Jin performing a card trick using playing cards featuring a photograph of him. Dr Lewis, an internationally renowned hypnotist who had a long-running show in Las Vegas, was one of seven performers featured in The Illusionists 2.0. 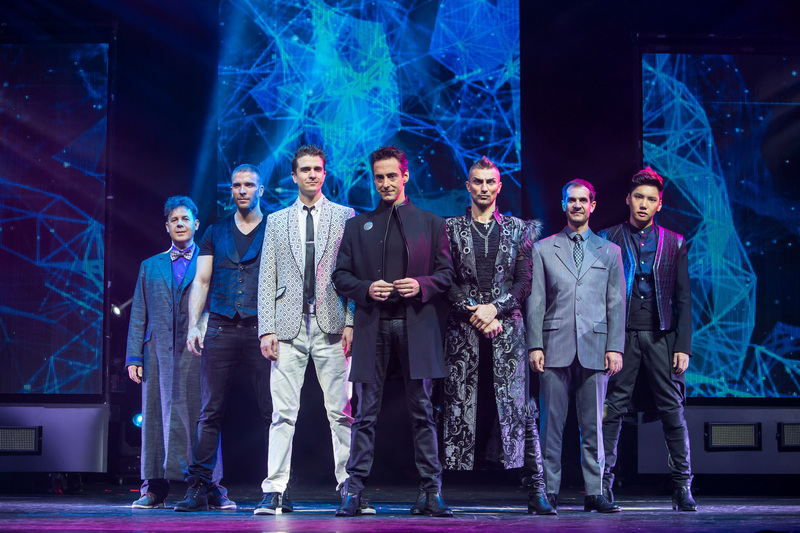 Billed as “the next generation of magic”, the show follows the sell-out success of The Illusionists at the Opera House last January. The other performers are Australia’s own Raymond Crowe as The Unusualist, Britain’s James More, who burst onto the scene via Britain’s Got Talent last year, as The Deceptionist, Portugal’s Luis de Matos as The Master Magician, Belgium’s Aaron Crow as The Warrior, American technology illusionist Adam Trent as The Futurist, and Korean card manipulator Yu Ho-Jin as The Manipulator. Arriving at the theatre, everyone is given a sealed black envelope with strict instructions not to open it until asked – just one of many audience participation moments. But fear not, everyone is treated gently and no audience members are harmed or humiliated in the making of this show. Several on-stage screens with colourful, pulsing video patterns, dramatic music and rock concert lighting along with the odd blast of smoke create a Vegas-like atmosphere. There’s also a large, central screen on which close-up 3D footage is shown for some of the acts. The Illusionists 2.0 is a fun, family-friendly show with magic across a range of different styles from The Deceptionist’s apparent impalement to The Unusualist’s sweet hand shadow puppetry performed to the song “What a Wonderful World”. The Warrior, a genuine showman whose cheekbones are as sharp as the sword he wields, lops off the top of a pineapple, standing on the head of a nervous looking volunteer, while his head is covered. The Futurist seems to be in two places at once, while The Master Magician orchestrates the opening of the black envelopes. My particular favourite was the exquisite card tricks of The Manipulator. Even with the 3D camera focused tightly on his beautiful, slender hands it was a complete mystery as to how the cards appeared, disappeared and changed colour. Performing with an expression akin to rhapsody on his face as his hands fluttered and swooped, Yu Ho-Jin, who is still in his early 20s, weaves a very special magic. During the show, you had a fair idea of how some of the tricks were done, while others left you wondering, ‘how on earth…?” The audience clearly loved the lot.